According to a recent study, sleep deprivation can lead to weight gain .Not getting enough sleep can affect our health in many different ways. We lose energy, as well as the ability to concentrate, and we become more exposed to various health conditions. But research also seems to indicate that sleep deprivation can lead to weight gain. This is because we tend to eat more when we don’t get enough sleep. A recent experiment has shown that the calorie intake for people who don’t sleep enough is significantly higher than for those that do get enough rest. Researchers at Columbia University, led by assistant professor Marie-Pierre St-Onge, conducted the experiment in question, and presented the outcomes at the American Heart Association conference, which took place last month. 26 adults, both men and women, of various ages and average weight, took part in the study. They were closely monitored during two 6-day intervals. Over the duration of the first 6-day phase of the research, 13 of the participants slept 4 hours each night, while the other half slept 9 hours. During the second phase, the first group slept for 9 hours, while the second only had 4 hours of sleep each night. The results were concluding: the people who got less sleep consumed more food. They ate around 300 calories more per day compared to those who weren’t sleep deprived. Not only that they ate more, but they also chose foods rich in calories and saturated fats. Actually, the most popular food amongst the sleep-deprived seems to be ice cream. So, a poor diet could also be related to lack of sleep. The results also showed that women are more at risk than men to over-eat in case of sleep deprivation. They had an average of 329 extra calories per day, while men only ate an extra of 263 calories. However, both these amounts of calories aren’t easy to burn, especially when you’re tired. The findings of the study mean that the link between lack of sleep and obesity can now be confirmed. They could also mean a new basic rule for dieters: when you’re on a diet, you must get enough sleep. 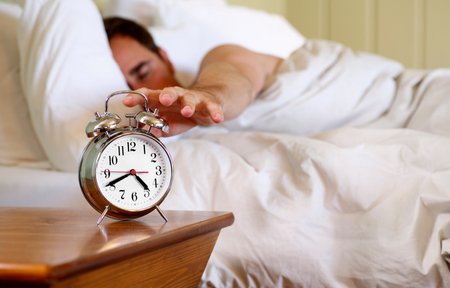 A few extra hours of sleep could make a difference when it comes to losing weight. A normal adult needs about 7-8 hours of sleep every night. Not getting them could lead to gaining a few extra pounds.